So last weekend we spent two days snowshoeing through the mountains. 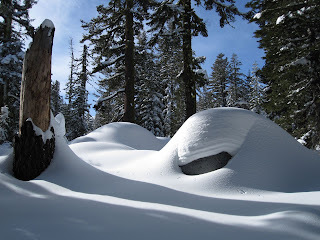 On the first day we drove up and then climbed Andesite Peak off the Donner Pass highway. It was a really lovely hike, and the weather could not have been more perfect. Snow conditions weren't bad either, with a pretty good crust over nice soft snow. When we went off trail, we sank in about 6-8 inches (well, P did. M had the good sense to stay in P's footprints, and found the going easier.) And the views from the top of the mountain were really wonderful. And the next day we went down to the road into Bowman Lake and hiked around the Bear Valley Nature Trail and beyond. Wonderful hiking, and on this day (and at this lower elevation) even the virgin snow was crisp, so walking was really quite easy. So it's pretty clear that we've become fans of snowshoeing. But we still have real reservations about snow camping. Hiking there and back is great. But we have some concerns about what we would do once we got to camp. Yeah, I know---we'd make a camp. And we'd cook dinner. But in the winter, it's dark 14 hours a day. So somewhere around 5:30 p.m. it's dark. It's cold. And fires are obviously a bit of a snag, since all the wood is wet from the snow. So...you sit in your tent for 14 hours? You sit out in the cold night for four hours, and then get in your tent? We're thinking that right about 5:30 is a great time to arrive back at the car, where you can drive to a nice hotel and take a warm shower, then go out to dinner. And then sleep in a room in a bed. But we also realize that we hear that a lot from people we try to entice into backpacking in general. They're fine with the hikes, just not so fine with the overnight accommodations. We always dismiss those concerns. I am sure snow campers would do the same to ours!